Most email service providers on the market today will have an email editor for creating email campaigns, but few offer what an email marketer truly needs. You should pick your email editing tool carefully. 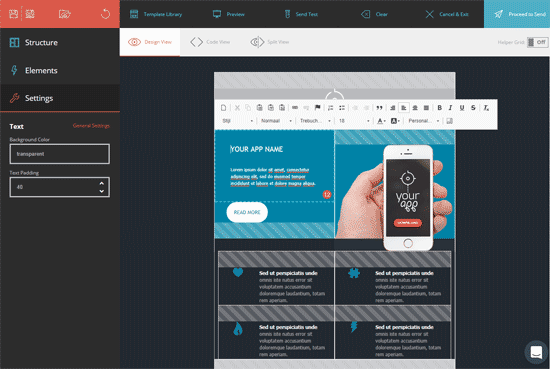 A drag and drop editor is definitely your best choice today. How to compare the best responsive email editors? What should an email marketer look for in a drag-and-drop email editor? High-quality responsive email output and a convenient user interface seem to be the most crucial requirements for drag-and-drop email editor nowadays. User experience is a quite subjective matter, but if you don’t like the way you have to interact with a software, you simply won’t use it to the fullest – and will always look for something new, something else. But don’t be fooled by a smooth UX! There are many email editors out there which are convenient to use, but often it turns out that the advertised responsive emails are not really responsive! Or maybe the prebuilt templates are responsive, but if you want to create something different or build up your own email template from scratch you’re stuck… and you’ll need to go back to good old HTML coding, which can be a complete nightmare these days! A disclaimer before we start, I work on one of these myself. How to choose? Price shouldn’t be your main concern – since most email editors are cheap compared to the value they provide. The HTML quality and functions will make a real difference. Make a list of the functions that are vital for you, and try different email editors out there. Each of them have different strengths. 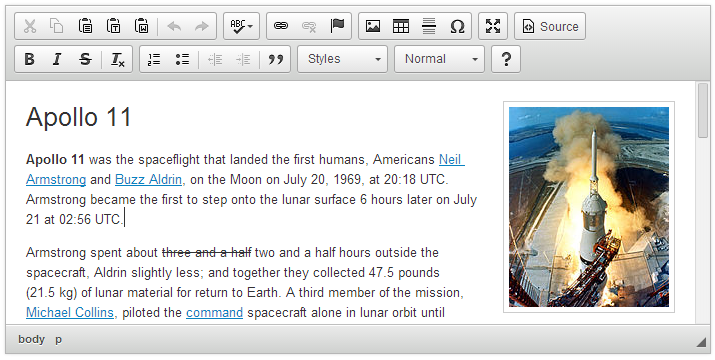 The Moosend Editor is a nice free email editor. It is the same as used in the Moosend email marketing platform, available for free. Users can start with on of the 50 pre-built email templates, or create on from scratch, with drag and drop columns and structure elements. For more technical people, they can also look at the HTML in a split view and make adjustments in its style via inline CSS. You have to press “apply changes” to see the updated html, luckily there is a handy undo function. It automatically makes the designs responsive for mobile devices. Moosend’s email editor tool is completely free to use, and you can save (and send) your newsletters by creating a login. EDMdesigner feels like a tool that was built for flexibility and customization. I might be slightly biassed because it is our tool :), but I think it is a fair trade off between flexibility and usability. 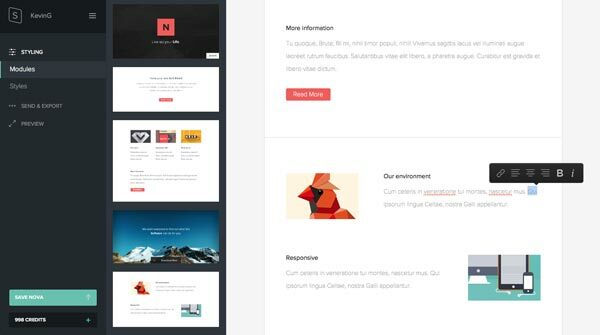 The editor features the mixture of structure and content elements, with advanced styling options thanks to which most email designs can be built with this email editor. Structure elements can be nested into each other, so this way you can literally any number of columns in the editor, and you can individually adjust the size of every column by pixels. In the email editor, you have options to add borders, paddings, margins and each of these can be changed by pixels. For example, it’s possible to add 13 px padding to a button with 17 px margin if that’s required by your email design. There are some additional functions which are not available in other responsive email editors, namely the hide on mobile / hide on desktop feature and the complex element. With the combination of the hide features, you can create different versions of your email on mobile and desktop, although I have to add that this feature is not supported by Gmail App – so on that both the mobile and desktop versions will be present. With the complex element function you can save your very own drag and drop elements, so you don’t need to recreate those blocks in future projects. In the free package you can save maximum 2 templates but image upload is not available, while in paid packages you can save 5 ($9,9/month), 25 ($39,9/month) or unlimited projects (custom deal). EDMdesigner’s responsive email editor is available for complete white-label integration, and is prepared for advanced customization options, like dynamic data, external functions, and includes 12+ skins and languages. Beefree is a handy email editor, where users can not only use prebuilt email slices, but can also create their own look and feel using the built-in content and structure elements. Designs are limited to maximum 4 columns, and structure elements cannot be nested into each other, so complex layouts are not possible with the tool. If we go deeper into the different styling options of the individual elements we see that border and padding are the available properties. Border size can be adjusted by pixels, while in case of paddings you can only use 5 px steps. Beefree’s online tool is completely free to use, but you cannot save your projects for future use. You can only initiate a one-time export. The exported ZIP contains the HTML + images. Maybe in future there will be a “Go Pro” option where you’ll be able to save your templates, but it’s not there yet. The editor itself can be embedded into other applications as well, with limited customization options. 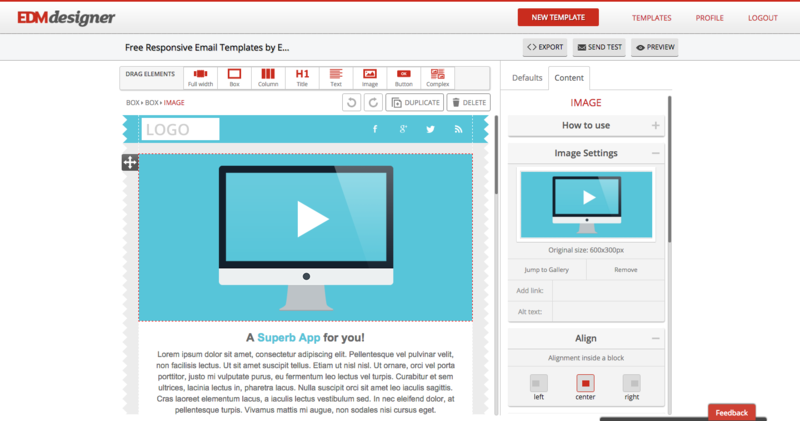 Stamplia was originally an email template marketplace, but last year they released an “email builder” which offers limited customization options for the templates you can purchase from them. It is convenient to edit and update the content of the purchased templates with the tool, but you cannot change anything apart from colors, images and text content. You can add new blocks though, but each and every block you add will look exactly the same as the original template. Stamplia’s builder is for those who don’t want to bother too much with the design part, and found an email template on their site, which exactly fits their needs. If you want to tailor the design more to your brand, you will need to look for a more advanced email editor. Update: The Stampalia email builder is retired now, but it was free to use with any email template purchased from their website. Stampready uses the same approach as Stamplia. So it’s easy to use, but very limited. You cannot create any template from scratch. You can only use the pre-coded email templates. (1 free template). Stampready does allow you to send the emails from their application either through a pre-paid or monthly plan, although the email send functionalities are pretty limited. What’s the difference between a drag-and-drop and WYSIWYG email editor? The term WYSIWYG – What You See Is What You Get – was well beyond it’s time, when it was first used in computing in the 70’s and 80’s. It is supposed to mean that what you are editing on screen will appear the same way (or very similar way) in print or as a finished digital product – email newsletters in this case. WYSIWYG editors are MS Word like text editors, which were created for general web content management. Mostly for writing text and adding some basic visuals to them. Normal WYSIWYG editors are not optimized for email, but you can create email templates with them if you know how to code HTML or you are a very advanced user and can embed tables easily with these tools (this is a really challenging task to do though). Inside an email marketing platform you might find such a WYSIWYG editor as shown above for editing (parts of) the email content. That is then placed in a template after you press save. Or you will be able to edit the email in place, clicking on elements. 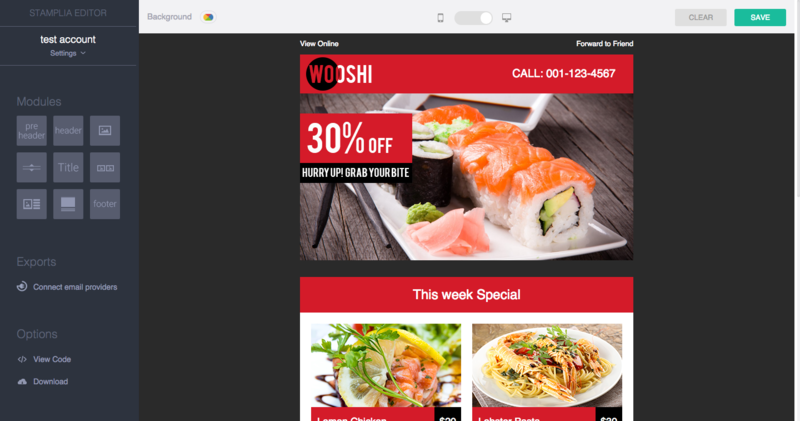 The drag-and-drop function itself is great, it is a big improvement compared to basic WYSIWYG editors or direct coding, but there are a great number of additional functions that can improve the whole email template creation. In a modern email editor you should be able to do most of the work in one place, without writing a single line of code! A good email editor will offer you the chance to use default templates as a base. This is great if you are new to email marketing, if you have little time to design a new email template from scratch, or just looking for ideas. Also you should be able to create your own email templates inside the system and build on your previous work. Of course you should get a user-friendly, cloud based file manager too, to save your templates, images, etc. A quick preview will show how your email looks on tablet, mobile and desktop. If you want to go deeper, a Litmus or Email on Acid driven email preview function will save you significant time. In case of our own editor we built up a responsive email generator engine using the above mentioned tools, so that any email template you create will look great on over 90% of all email clients – this is what you want from any email editor. It will significantly reduce time spent with email testing and fixing. Built-in image editing is one of the features that can come in handy. Of course we are not talking about Photoshop-level capabilities but basic things like resizing or some image modifications, which are usually available through a tool like Aviary. Plus there are tons of advanced functions in the different email editors, that some users will find necessary, while others will never use. Personalization, automation and dynamic content rules are generally available in advanced ESPs or marketing automation tools. An extra advanced function you can look for in an email editor is “hide on mobile / desktop”. This will allow you to fine tune the mobile responsive version of your email as it shows on mobile devices versus what elements it shows on desktop. Many call their email editor “drag-and-drop”, but are they really? The meaning of drag and drop can hardly be simpler, it is exactly what it sounds. You can drag the items you need from one part of the user interface to another and simply drop it in the desired place. Just like moving icons around on a desktop. But that is not completely true today. Drag-and-drop became a synonym of user friendliness and easy to use interfaces. Numerous tools, including email editors are marketed as drag and drop, but that doesn’t always mean that you will get a sophisticated drag-and-drop capability. In most email editors you will be limited to use prebuilt “blocks” such as image + text, image group, social share and similar. You don’t have the flexibility to create your own blocks from the very basic building elements like text, image, box, and columns purely by using the drag-and-drop functionality. They are still drag-and-drop email editors, but not every content element can be “dragged and dropped”. In many cases building blocks are enough, but for sophisticated designs… you will need more. 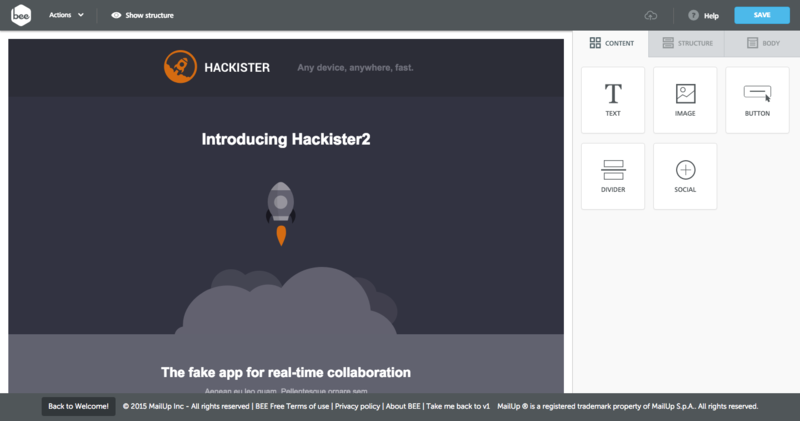 What shows that you are using a real responsive email editor? If you cannot edit the HTML source code, you are at the right place. Why? Because the actual responsive HTML output is generated by the software after you finished your work with the template. In most cases where you have the option to edit the HTML code, you are using a “pimped up” WYSIWYG, which will allow you to destroy the pre-built responsive HTML you are editing. The downside of this approach is that you cannot simply copy-paste a random HTML to an email editor like this. Either you need to build up your template with the editor or ask the software provider to prepare the actual email for you. There are many other email editors built into other email marketing tools, but in most cases you cannot export the HTML code from them, and email code quality is also a big question mark – you never know what will work or what not, if you don’t test it. The downside of using the ESP’s built-in email editor is that you are locked to that service. The upside is that you don’t need to go to another provider to deal with email design. If you are starting out with a “free” package of an ESP, and get used to their email editor and everything else, you will be unlikely to move to another provider. Even if you want to move for some reason, it will be hard to bring your email templates with you. If you are a newbie in email marketing, you can pretty much start with any software, since most likely the design won’t be your biggest concern in the beginning. But don’t forget to come back to this list, when you got a deeper understanding of the power of email. There’s always room for improvement and of course your email design and code quality are essential parts of your recipe for success! Roland Pokornyik is the CEO and Co-founder of EDMdesigner.com, the responsive email editor API optimized for white-label integration with any system.